And you are right, it was. With narrow boards and heavy rigs most people struggled to stand on the board holding the sail. There was no sense of achievement for most of us… just a realization that this was one sport that was beyond us. And it’s not just windsurfing… there’s a belief that kite boarding, surfing and even standup paddle boarding are all too hard for mere mortals. And maybe that was true in the early days of the sport, but not anymore. Let’s fast forward to the present day, and what has changed. The boards are far more stable and, in windsurfing and kite boarding, the sails are lighter and easier to handle. Everyone can now get up and start moving and when you do, the smile you crack goes from ear to ear: there are very few experiences to compare to your first real board experience, be it windsurfing, kite, surf or SUP. That’s not to say that this sport is easy… there’s still plenty of challenge to be had. As you progress you’ll find there’s an increasing amount of art to the skill, not to mention a zen-like outcome when you find the right balance point between nature, board and body. And we can get you there. Hampton WaterSports has been hosting the Southampton Town Program since 1993, teaching thousands of kids and adults to windsurf. These beginner classes cover all of the basics of how to windsurf with the main emphasis being on having fun first and foremost! 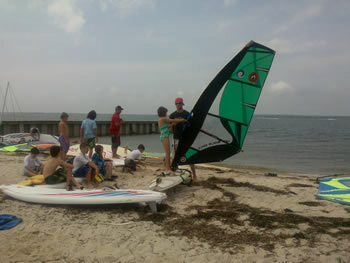 In three two-hour classes the students will learn to windsurf though specifically-designed games and races. Morning and afternoon classes give you the flexibility to choose which class fits your schedule. The morning class runs from 10:30am to 12:30 pm. The afternoon classes run from 1:00pm to 3:00pm. Our certified instructor and assistant teach these programs, together they give the students the personal instruction needed to learn to windsurf. Instruction is available to all skill levels from beginner through advanced.